Betty J. Kosmo (nee Ehrsam), age 93, of Lorain, passed away peacefully on Friday January 4th, 2019. 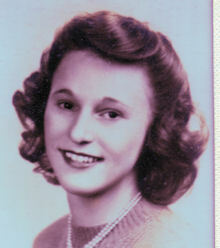 She was born in Sandusky on March 13, 1925 and was a 1943 graduate of Sandusky High School. During World War II, Betty volunteered as a candy-striper nurse’s aid at the local hospital in Sandusky. She was first employed as a stenographer for Erie Insurance. She subsequently served as Secretary to the President of Western Securities and later served as a teller for the Cleveland Trust Bank Company. Betty then entered her longest and most fulfilling career as a devoted homemaker, wife, and mother. Mrs. Kosmo was a member of St. John’s United Church of Christ in Lorain. She was regarded by many as a creative soul and found great enjoyment in decorating her home for each and every holiday. She also possessed a flair for fashion and felt that a woman wasn’t completely dressed without the appropriate beads and accessories to accentuate her outfit. In her free time she enjoyed playing board games as well as tending to her rose garden. Betty leaves her husband of sixty-six years Robert, daughters Kathleen (Tim) Wiles of Spencer and Judy Kosmo of Avon Lake, and son Rob (Sue) Kosmo of Amherst. Additional survivors include grandchildren Gretchen (Eric), Grant, and Michael, and great grandchildren Falon, Vayda, Devon, Chase, and Paige. She was preceded in death by parents Arnold and Hertha (nee Troike) Ehrsam, brother Arnold Ehrsam, Jr., and sister Marguerite White.